The first game of the Dokomo Cup: The Second Women's Kisei title match was held at the Hotel Sun Route Hiratsuka in Hiratsuka City, Kanagawa Prefecture, on January 22. This is the only TV tournament with a challenge-match format. The defending champion is Kobayashi Izumi, who won the first title match last year, and the challenger is Sugiuchi Kazuko 8-dan. This is the latter's first appearance in a title match since the Women's Meijin title match in 1995. The game ended after 207 moves, with Kobayashi, holding black, forcing the challenger to resignaiton. Kobayashi now needs just one more win to retain the title. The game will be broadcast on the Sky Perfect TV Go and Shogi Channel at 6:30 pm on Saturday, January 30. The 23rd Kisei best-of-seven title match, sponsored by the Yomiuri Newspaper, has got off to a start. Cho Chikun, who is aiming at his fourth title in a row, is being challenged by Kobayashi Koichi 9-dan. This is the first match between these two great rivals for five years. 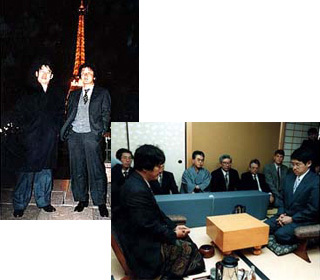 The first game was played at the Japanese Culture Centre in Paris on January 13 & 14. After 203 moves, Cho, playing black, forced Kobayashi to resignaiton and so got off to a good start in his title defence. Of their time allowances of eight hours each, Cho was down to his last minute and Kobayashi had two hours one minute left. The second game will be played at the Nihondaira Hotel in Shimizu City, Shizuoka Prefecture on January 27 & 28. China's first international tournament, the Spring Orchid Cup, has been launched. 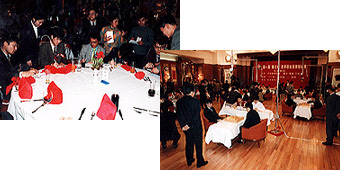 The first two rounds were played on December 26 and 28, 1998, in Beijing, with 24 players from 6 countries participating. Six players from Japan participated, headed by Hikosaka Naoto Judan. Of these, two have survived the opening rounds. They are Yoda Norimoto Gosei and O Rissei Oza. The quarterfinals will be played at the end of April.